Love the view. Love the location. Property was very clean and all the workers were very friendly. Very spacious and clean. Very quiet as well. Every one was friendly and helpful. Overall A+. Just would like to see a more secure front door. 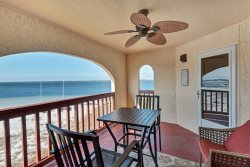 This is a beautiful condo, so relaxing with the beautiful beach right outside the windows. We loved this unit and the Summerwind. We will definitely be back. Thank you. Everyone was so kind and friendly. It was a perfect getaway! Not one thing to complain about, the property is beautiful. We can't wait to stay there again. Thank you for addressing our clogged shower drain so fast and completely! I reported the problem at 10am and it was taken care of by lunch time the same day! Enjoyed the condo at 303 Pearl. It was well taken care of and very convenient to any place we needed to go in Navarre. One of the lamps on the end table next to the couch needs replacing but other than that everything was in great condition. Thanks for a great family vacation! Excellent staff and very friendly and courteous. We loved being there. The pictures do not do it justice. It is even nicer in person. Very spacious and close to everything we needed. The rental process was simple and the employees courteous and helpful. Although shortened, we had a wonderful time. The condo was beautifully furnished with all we needed. We really appreciated the security of entering the property and room access. We will definitely be back, but not in hurricane season. It was better than a hotel. We had more freedom. The actual property was lovely. It was an excellent experience! !